From fancy hotels to simple hostels, you will find a range of accomodations in all major cities and the vacation areas. In recent years, new hotels and bungalow complexes have been built in remote areas and in National Parks. The latter - so-called cabañas - are fully equipped small buildings incl. kitchenette, a cheaper alternative for families than hotels. The price-performance ratio can vary considerably among hotels (hotel, hostería). There is no general classification system, and claims to so many stars do not say anything about the quality of a place. When making one's selection, it's always a good idea to look at size and location of a room, private bathroom (baño privado), necessities (TV, phone), and service. Breakfast is usually included, but it's only worth mentioning when it's designated as desayuno americano or buffet. In high season (December to February), prices for medium and top hotels can be compared to European ones (starting at about USD 40.00 for a medium category single). Single rooms are usually not much cheaper than a double. Simple hostels (residencial, hostal, hostería, casa de familia) offer cheap accomodations, but you will have to make allowances when it comes to creature comforts. The closer to the bus station, the simpler the room, and the more questionable its cleanliness. There are very few youth hostels, and they are only open in mid-Summer (January/February). Those travelling by car will find many motels along the Panamericana where guests usually stay in small bungalows. This discrete arrangement is not surprising given that these hotels are socially acceptable, sometimes quite fancy, locations for undisturbed sexual encounters, which often also function as normal hotels outside the big cities. Reservations & Taxes: Room reservations are only necessary during high season and in tourist areas. Starting from medium category up, you can use a credit card for paying. International tourists need not pay value-added (sales) tax (19%) when paying in USD (cash or travellers' cheques), but this discount is not always applied automatically. Especially in some of the National Parks, tent camping is the only option. Most camping sites have only modest facilities; showers and hot water are an exception. In the tourist centers, privately run sites often offer more comfort, but sometimes only at a considerable price. Unregulated camping is legal in most National Parks, and it is usually not a problem in remote areas; however, one should try and ask the owner of the land for permission. Important: Leave no traces and take your trash. Simple maps are distributed at the airport and the tourist information center Sernatur, Av. 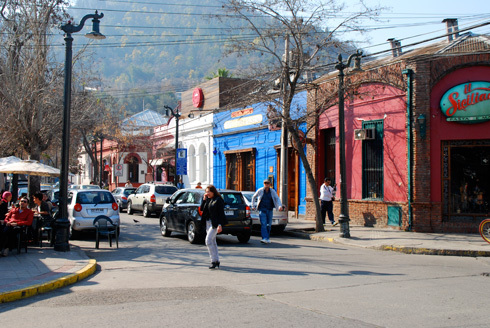 Providencia 1550. ContactChile also published its own complete citymap with city guide, which can be purchased from some bookstores, the ContactChile office and at trekkingchile.com/maps. The handy IGM/Mapcity publication also includes information about the bus lines. Basically, Chileans appreciate politeness and certain phrases, even though as a foreigner, you will enjoy a certain gringo/a bonus. The greetings take some getting used to, men shake hands with each other, while men and women as well as women among each other will blow a little kiss towards the right cheek, even among strangers, who can also add shaking hands to that. Same works for saying good-bye. What you should say is Buenos días (until Noon), Buenas tardes (Noon to approx. 8 p.m.), and Buenas noches (starting at approx. 8 p.m.), to take leave say Hasta luego or Adiós. When turning down an offer, always say No, gracias; just Gracias will usually be taken to mean consent (Sí, gracias). For appointments you usually have about 15 minutes "wiggle room". Long distance buses and planes are usually on time. Little things such as long hair and earrings in men, short skirts, unshaved legs and armpits in women, as well as insufficient deodorant are equally repulsive to the spiffy Chileans. At work, dress is formal, and in most offices, ties are required. 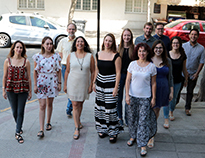 However, people will quickly make the transition from the more formal address (usted) to the more casual tú with colleagues and acquaintances, except in very formal contexts, and especially young people (up to about 35 years of age) are not very likely to be addressed with usted. When in doubt, it is safer to stick with the more formal (usted), especially with older people. The voltage is 220 V / 50 Hz, and appliances also need an adapter (adaptador) to plug into the Chilean sockets, which can be found in supermarkets or specialty stores. From the travel books about Chile we recommend the Chile Handbook from Footprint Press which is updated every other year, or their South American Handbook published new every year. 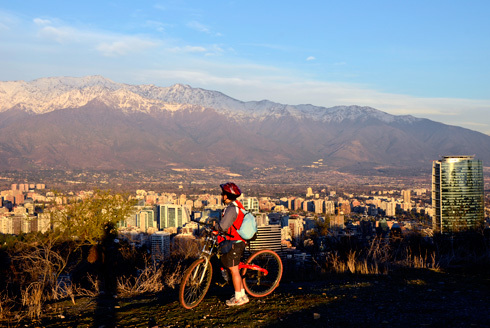 The Australian publisher Lonely Planet has also published several good guide books on Chile; most recently, the handy Santiago Guide. The Chilean travel guide Turistel which is updated annually has lots of detailed information (in Spanish) and good maps. It comes in three volumes plus road and camping maps, and can be bought from bookstores and kiosks. In Chile there is no need to fear any specific health hazards. No special shots are necessary; there is no malaria or cholera. It is, however, advisable to update one's standard protection against typhoid, poliomyelitis, hepatitis, and tetanus. Beware of tap water, raw vegetables and fish or other seafood, raw eggs, and food offered in the streets. Wash and peel all fruit and vegetables carefully. Medical treatment in private hospitals in Santiago and other major cities is comparable to top international levels. Before you leave for Chile, check with your existing health insurance on their coverage of international travel, or get additional insurance. Private hospitals will recognize credit cards as a guarantee. All drugs are available, and most doctors speak English. Appropriate medical care can be more difficult to get in rural hospitals or at First Aid posts. Chile's mail works well, if somewhat slow. The regular postage for a letter is 310 pesos in country, 400 to North America, and 470 overseas. The main post office on Plaza de Armas in Santiago is open Mon - Fri from 9 a.m. to 7 p.m., and Saturdays from 9 to Noon, and there are additonal post offices in other districts. International mail is usually sent by airmail automatically (vía aérea), and it takes 4-8 days to Central Europe or North America; which can be speeded up for a fee (expreso). Important letters and packages should be sent by registered mail (certificado). If you want to have someone send you mail to Chile, ask them to mark it 'Lista de Correos' (poste restante). The post offices will save this mail for 30 days. Nice postcards can be found at the Museo de Bellas Artes and the Museo Precolombino in Santiago. Newspapers: The biggest daily with an extensive cultural section is the conservative Mercurio, one of the oldest newspapers of Latin America. The Mercurio Corporation also owns several other papers in Santiago and in the provinces. Other dailies are La Tercera, the evening paper La Segunda and the free papers Metro and La Hora. Current and independent information can be found in the online paper El Mostrador. Magazines: The market for magazines is dominated by gossip zines such as Cosas and Caras. Political analyses are found in Siete+7 (liberal), Qué pasa (medium) and Ercilla (conservative). Biting satire, but also hard-hitting reporting is provided by the bi-weekly The Clinic. Chilean TV is dominated by soccer, series and entertainment. The evening news are at 9 p.m. on most channels. Cable is standard in the better hotels, and more than 80 channels from all over the world are available. Radio: Among FM stations, the fare is mostly music and entertainment; especially popular with young people: Rock&Pop (94.1) and Radio Zero (97.7). News at 93.3 (Cooperativa) and 100.9 (Chilena). The official currency is the Chilean Peso (CLP), which uses the confusing symbol for USD ($). Over the last few years, the rate of inflation has been around 5%. Spending Money: The best way is drawing cash (pesos) with your money or credit cards from automated tellers marked with the Cirrus, Plus or Maestro symbol in all major cities - know your PIN! You have to count of paying a fee (find out from your bank before you leave). Otherwise, take travellers' cheques and cash in US dollars (in a money belt) and exchange money only in official places (never in the street) or banks (usually worse rates, and only open from 9-2). 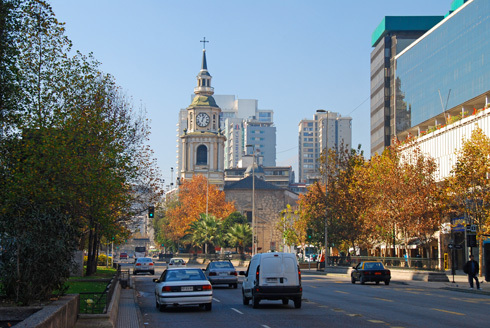 Santiago has the best currency conversion rates; several exchange places are located on Agustinas between Ahumada and Bandera (open Mon-Fri 9-7, Sat morning), as well as near Manuel Montt, Pedro de Valdivia, and Los Leones Metro stations. The AmEx office in Isidora Goyenechea 3621, piso 10, Las Condes, Ph. 2 3506700, Mon-Fri 9.30 a.m. - 5 p.m., is only worth the trip if you have large amounts in AmEx travellers cheques to convert. On the weekend, the larger hotels exchange money, too, but at a bad rate . In Chile, there are two police organizations, the uniformed police (Carabineros) and the plainclothes detectives (Policía de Investigaciones PDI). The Carabineros are responsible for safety in the streets and enjoy a high level of trust in the whole country. It's important to always carry your papers with you in case you get stopped, in which case you would be asked for your ID (this is legal, if rare, in Chile). Never try to bribe a policeman! Compared to most Latin American countries, Chile is very safe for travelling. Exceptions, are, as everywhere, the slums and the centers of the big cities. Beware of (well-dressed) pickpockets who practice their swift tricks especially on the Metro, on buses, and in crowds on busy streets. On the other hand, cases of robberies at gunpoint or muggings are rare. Leaving your luggage where you are staying is usually not a problem, even if they should not have a safe. When valuables are missing, go to the nearest police station, have a report filed (dejar constancia), and make a note of its number (for your insurance company). Chile is safe even for those travelling alone, as long as they use common sense and safety rules. Women need to be resolute enough to get rid of unwanted attention. Chilean machos are usually only a nuisance when in a group, and verbally; otherwise, they are quite harmless. Never hitch-hike alone! In recent years, Chileans have made a massive transition to mobile network counting more mobile phones than inhabitants by now. In urban centres it is possible to use mobile internet connections with 4G, while in rural areas the network connection may be quite poor or inexistent. Mobile phone numbers are nine digits long and can be recognized by the 9 as the first digit (after the country code +56). Bring your own smartphone and use it in roaming mode if the operator offers this service for Chile and if it is a triband device. However, this option might be expensive due to the high roaming rates for outgoing and incoming calls and SMS. Buy a prepaid mobile phone in Chile (“celular de prepago”). It is not possible to use it for making calls to other countries, but to receive calls from abroad. The three providers Movistar, Entel and Claro have hardly any differences. Foreigners with a visa can also purchase mobile phones with a contract ("plan"). Bring your own smartphone and let a Chilean network operator insert a SIM chip. An online registration of the smartphone is necessary in order to operate it. Make sure you know the brand, model, place and date of purchase (keep the sales receipt at hand) and the IMEI number. Sounds complicated, but it is the cheapest option. After certification and payment of a small basic fee, the smartphone can be used as a Chilean prepaid device. Important: You must own a smartphone without SIM lock! More information here. UTC/GMT minus 3 hours. This means that the majority of the countries in central Europe including Spain have a time diference of 4 hours with Chile between the end of March and the end of October and of 5 hours during European summer time. Daylight savings time in Chile is suspended as from 2015. In restaurants a tip of about 10% is expected; it is not included in the bill. It is customary to take all the change first and then leave a tip. Gas station and parking attendants also expect a tip of 100 to 200 pesos, but cab drivers are not tipped. Due to the generally high hygienic standard there are no vaccinations required to travel to Chile. However, the following vaccinations are recommended: tetanus, diphteria, polio and hepatitis A, eventually hepatitis B in case of long-term stays. If you plan to travel through rural areas, you might want to get vaccination against rabies. Foreign tourists are officially banned from working in Chile for money - unless their activity is entirely paid for from abroad (e.g., for artists, exchange teachers, etc.). A temporary work permit will only be issued in exceptional cases (from the Extranjería in Santiago or in the provinces), and it is usually restricted to international artists. However, there is a large, informal (grey) area in the Chilean labor market. If you manage to get a work contract from a Chilean company or institution, you can apply for a visa, either through a Chilean Consulate abroad or through the Extranjería once you are in Chile. If you have got a university diploma, you may also have it recognized by the Chilean authorities and apply for a temporary visa with a work permit.